Following the stormy break up from Ibersuizas, four years ago now, the managers of Portobello Capital are living days of wine and roses. The Private Equity firm was awarded with the best Spanish Fund in a industry gala dinner in Europe and also with the best transaction, the sale of Indas to a Canadian group. Furthermore, the partners have just moved to their brand new offices in Madrid’s financial heart. But the icing on the cake has been the closing of its third private equity fund, going above the best expectations, and raising 375 million euro. This amount was reached last 11 August, after barely 9 months of road show visiting investors. The initial plan was to raise around 300 million within 18 months, according to the estimations of the investment bank hired for the process, Probitas Partners, so the Fund was not expected to be closing until the first quarter of 2015. However, the welcoming of the European pension funds, specially the German ones, was so great that Portobello could close its new vehicle before and with more money than expected. Financial sources have confirmed that the firm has closed its fundraising period. A key milestone was Goldman Sachs’ decision, one of Portobello’s traditional investors, of not to invest in the new fund. The reason behind this decision was not the dissatisfaction on the return gained from the previous vehicles, but the American bank strategy on reducing its presence in the private equity sector. 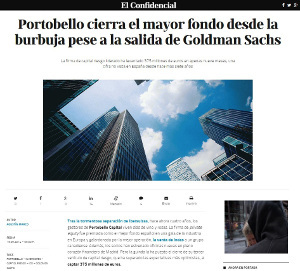 Goldman Sachs’ role, which would have served as the pull effect for other investors, was taken by the Instituto de Crédito Oficial (ICO), which has contributed 60 million euro thanks to the plan approved by the Ministry of Economy to promote the private equity industry. The public entity launched in 2013 a fund to lend up to 1,500 million to private equity firms aiming to boost this sector that had been paralysed due to the difficulties to find financing amongst foreign investors. ICO’s contribution, together with the 40 million commitment from the European Investment Fund (EIF), has attracted Spanish and continental pension funds to complete Portobello Fondo III. Subscribers of the Fund include the Spanish managing companies of La Caixa, Bankia and Banco Santander. German firms and other French and Italian ones such as Axa and Generali stand out amongst the foreign investors, representing 70% of all. The unsatisfied demand has been so great that ICO will probably sell half of its share, remaining in the Fund with a 30 million commitment. Together with the closing of the new fund, Íñigo Sánchez-Asiaín, Juan Luis Ramírez, Fernando Chinchurreta, Luis Peñarrocha and Ramón Cerdeiras, Portobello’s five partners, have been reviewing their portfolio during the summer to decide what to sell after several failed divestment attempts during 2012. One of the companies that is back in the market is Hofmann, company focused on digital photo printing, deal that has been entrusted to JP Morgan. In the next few months, the private equity firm will also decide on Angulas Aguinaga, Multiasistencia and Mediterránea de Catering. Three companies that have successfully held on during the crisis thanks to their internationalization and that are now benefiting from the recovery of the national demand. The company focused on food services has recently been awarded with contracts for the canteens of Atlético de Madrid, Vodafone and Banco Santander, where around 7,000 employees eat every day. The company will need a bit longer to divest Festa, fashion retailer that had to purge its expansion through a creditors meeting back in 2012, and Veinsur, company focused on industrial trucks that suffer the industry’s collapse and it’s now value at zero in Portobello’s portfolio.